Since this is a novella telling the story of Tod, one of the characters in the Soul Screamers series, to fully appreciate what's going on, I suggest you read at least the first two books in the series. You don't have to, but Tod is a character that starts off small, and then grows to be pretty prominent later on, so if you really want to get a great reading experience out of this novella, read as many of the Soul Screamers books are you can first. With that said, onto the review. I am very firmly Team Tod. I have been since the second book, My Soul to Save , when I saw how truly caring he was. It was so great to finally get an all Tod story, he's in my opinion one of the best characters in the whole series. His snarky brand of humor never fails to put a smile on my face. In Reaper, we see how Tod died, and how he became a grim reaper. But in finding that out, we also find out something very big about Nash, too, something that even Nash doesn't know. I have a feeling that information will be important later on in the series. We also see a more emotional background for Tod, along with his innermost thoughts. This is a must read for any Team Tod-ers out there! 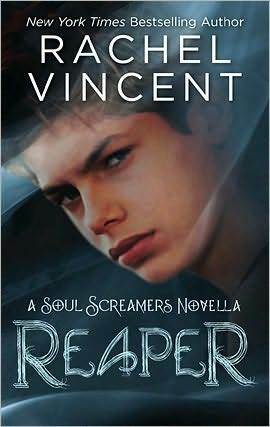 And any fans looking for more Soul Screamers while they wait for the next book should definitely give Reaper a look. I give it 4 out of 5 stars. Awesome review. I'm definitely Team Tod as well and adored this novella.